The calm volcano outside the Mirage Hotel and Casino in Las Vegas, Nevada, USA. 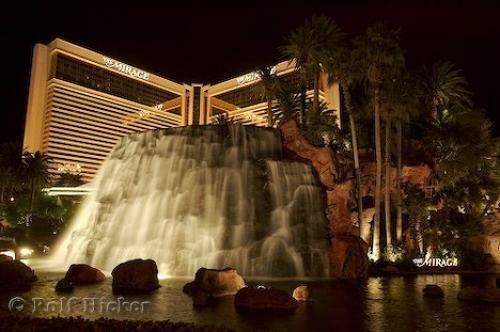 Like the calm before the storm, the volcano in front of The Mirage Hotel and Casino along the Vegas Strip in Las Vegas, Nevada is just a peaceful waterfall. Every hour the volcano bursts into life like thunder while flames are shot high into the sky. The once tranquil waterfall is transformed into a molten lava flow. This show in front of the Mirage Hotel in Las Vegas is a must see while walking The Strip.